Parents snapped a photo of Jennifer Bowling, all groggy smiles as she was being wheeled into transplant surgery. She had been on the kidney-pancreas transplant list just 12 days before a donor was found. The average wait is three years. Jennifer Bowling can scarcely remember a time after her 8th birthday when her health hasn’t beaten her up physically — some days, emotionally. After 23 years, countless hospital visits and diagnoses, medications and surgeries, and a kidney and pancreas transplant, she knows about pain. 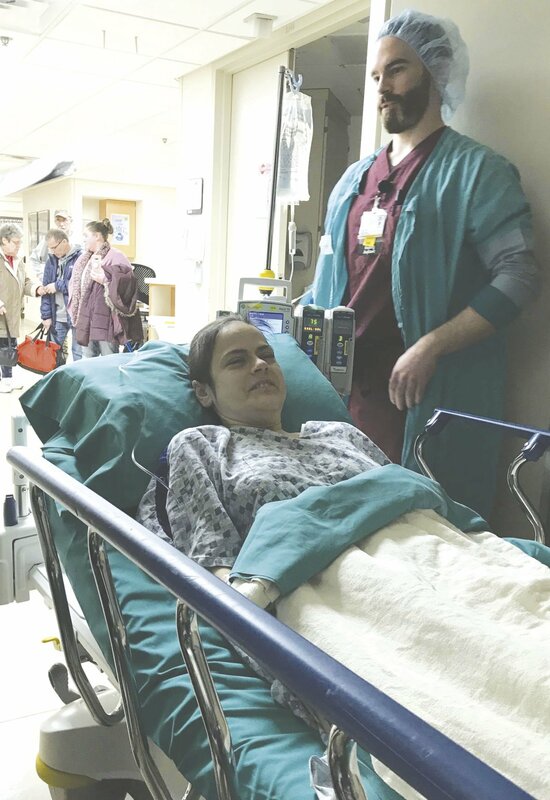 But she will endure and prosper, the Maquoketa woman said, thanks to her loving family and friends, a supportive community, and a wonderful medical team. Bowling, 31, hopes to thank them all next weekend during a benefit to help her pay her mounting medical bills. The benefit will begin at 4:30 p.m. Saturday, April 13, inside Pearson Memorial Center at the Jackson County Fairgrounds in Maquoketa. The event includes food, a live and silent auction, live music by Jammer and games. The public is encouraged to buy tickets in advance so organizers know how much food to prepare. It started as an autoimmune diagnosis. Bowling was 8 when her mom, Deb Bowling, noticed her enlarged thyroid, which influences bodily functions such as metabolism, rate and strength of heartbeat, blood flow and body temperature. She was diagnosed with hyperthyroidism. Doctors also told Bowling that she carried the AMA receptor, which means she’s at risk for various autoimmune diseases. “I started taking a little pill. It didn’t matter to me at all,” she said. By eighth grade, she weighed little more than 111 pounds. She couldn’t stay hydrated — a problem that still plagues her. When her blood sugar level registered 504, she was sent to the University of Iowa Children’s Hospital in Iowa City, where she spent about a week learning about her Type I diabetes and how to give herself four insulin shots each day to regulate the problem. So, she joined the dance team and played softball, always keeping plenty of sugary sports drinks on hand. “I’m going to handle it and go about my life,” she said of her philosophy. Gastrointestinal pain, neuropathy (sensitivity) in her feet, and dizziness plagued her when she left for college. A weeklong stay at Mayo Clinic in Rochester, Minnesota, revealed that Bowling suffered from gastroparesis, which slows how food leaves her stomach. It interferes with regular digestion and causes problems with blood sugar levels and nutrition, according to the Mayo Clinic. The cause is unknown. Bowling studied fashion merchandising at Kirkwood for two years, then transferred to Dubuque to study nursing. Her studying was laced with trips to the ER. “I was always so dizzy and dehydrated,” Bowling recalled. Doctors diagnosed kidney infections. She moved to Los Angeles, California, in 2011 to renew her passion for fashion. “I have to do my dreams,” she said. That came after, only weeks earlier, she had passed painful kidney stones; one measured 7 mm. The kidney infections, dehydration and pain continued in California. She found herself in taxis traveling to various hospitals. “It was tough. You can’t just jump on a plane and go out there [to help],” Deb said. Bowling graduated from college in 2012, but not without weeklong hospital stays, pneumonia and more kidney infections. After finishing her last final, she left the classroom, took a taxi to the hospital, and passed a 21 mm kidney stone. She moved back to Maquoketa and saw a nephrologist, a doctor who specializes in kidney function. Bowling was diagnosed with kidney failure. When Bowling developed pancreatitis, doctors discovered her high creatinine levels. Creatinine is a chemical waste product that a healthy kidney will filter out and leaves the body through urine. A typical level is 0.5-1; Bowling’s was 2.2, further indication of kidney failure. She fought everything, but her traitorous body refused to cooperate. She spent weeks on end in the hospital dealing with medication resistance, fungal balls on her kidneys, and allergic reactions. 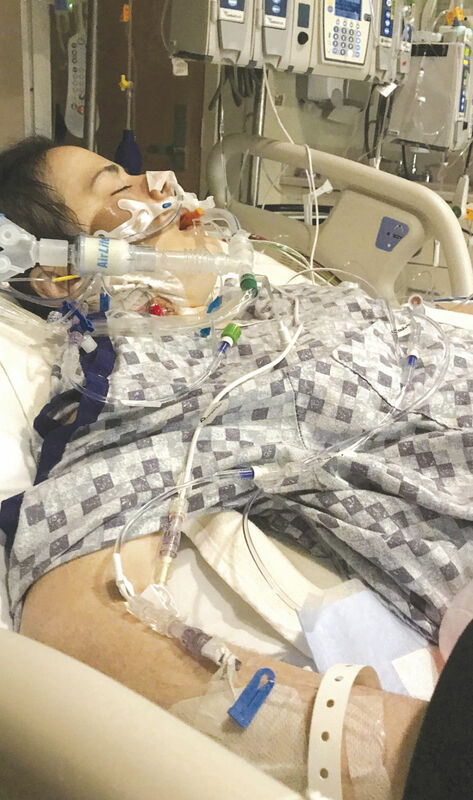 Doctors told her parents “it’s bad” during a hospital stay in Iowa city in May 2018. “‘At this point we’re not worried about dialysis, we’re worried about keeping her alive,’ doctors told us,” Deb recalled. One month later, Bowling had no other option but to go on dialysis, which is a process in which machines and medications remove the waste from your blood, taking the place of malfunctioning kidneys. She endured four-hour treatments three days a week. After three months, she switched to peritoneal dialysis, which allowed her to clean waste from her blood every night while she slept. On Oct. 17, 2018, Bowling’s doctors said she needed to be placed on the waiting list for a new kidney and pancreas. After extensive testing of each body system, she was accepted to the list Jan. 16, 2019. The double organ transplant is fairly typical for someone who has kidney failure related to Type 1 diabetes, according to the National Kidney Foundation, which said the survival rate is about 95 percent. The foundation said the average wait for a simultaneous kidney and pancreas is about three years. “I never usually answer my phone when there’s no caller ID,” she said. But when the phone rang at 7:12 a.m. Jan. 28, something motivated her to answer. The weather was bad. The new kidney and pancreas arrived in Iowa City at 7:30 p.m. Within 40 minutes, doctors rolled Bowling into surgery, which began at 9:15. The surgeon even showed her a picture of the new organs that were about to be implanted inside of her. “They look pretty” is the last phrase Bowling heard before anesthesia took hold. She woke up to the breathing tube being pulled out. Surgery had taken about 2.5 hours instead of four to eight. The surgery went better than expected, and Bowling was doing fine. The old kidney was left to shrivel up inside her, she said. The new kidney was implanted on her left side and the pancreas on her right. The Bowlings learned that a 26-year-old woman had died and was an organ donor. They do not know how she died, only that her organs were healthy. “We felt so sad for her family, but so hopeful and blessed at the same time,” Deb said. Bowling also found out she was second on the transplant compatibility list. The first person on the list, a man, turned down the new organs because he wanted to be at his daughter’s wedding, she was told. Bowling, who endured insulin shots at least four times per day, hasn’t had an insulin shot since her transplant. She takes at least 26 prescription medications per day, including anti-rejection meds. She still struggles with gastroparesis and anemia (low iron). She still tires easily, gets dizzy and has a low white blood cell count, which makes it easier for her to get sick. Following a transplant, the organs function for an average of 15 to 20 years, according to the National Kidney Foundation. “I get anxious about how will I know [if the organs are starting to fail],” Bowling said. “Everything up to this point made me stronger and stronger,” Bowling said. “I’m so grateful to be here and for the community that’s supporting me. “I never told anyone what was wrong with me, not even my friends. I just didn’t know how. But now I talk about it with them and with a therapist. Don’t bottle it all up,” she said. In honor of April Organ Donor Month, her mother encourages everyone to consider becoming an organ donor. “Otherwise you’re being buried with gold,” Deb said. “Don’t take it with you,” Bowling added. Cost: $12 donation ($10 in advance), kids 5 and younger eat free. Tickets available at the door. Scattered clouds with the possibility of an isolated thunderstorm developing this afternoon. High around 75F. Winds S at 10 to 20 mph. Chance of rain 30%. Mostly cloudy. High near 65F. Winds N at 10 to 20 mph. * AT  8:30 PM SUNDAY THE STAGE WAS 19.4 FEET AND STEADY. MORNING, THEN BEGIN FALLING NEXT SUNDAY. * AT  8:00 PM SUNDAY THE STAGE WAS 17.5 FEET AND STEADY.